Woodford Town kept their winning run going after a later Taku Mashingdaize goal finally saw them defeat a resilient Leyton Athletic side that often belied their lowly status. Eli Benoit is now in the Leyton Athletic dug-out and he would have been happy with the performance despite the result. Leyton had an early effort when a free kick from the left was rifled wide by Francesco Cicconi. The Woods were not able to create too much themselves until the 14th minute when Jayden Thompson-Brissett had a shot tipped around the post by James Scammell. The Woods then cranked it up and their next forward move ended up with Ethan Kessel being fouled just outside the box by Junior Miller. Thopmson-Brissett’s resulting free kick forcing a full-stretch save from Scammell to prevent the ball curling into the top right-hand corner. Kessel then delivered a pin-point cross that Temi Babalola got a head onto; the Leyton ‘keeper again pulling off a top drawer save to keep the ball out. Leyton Athletic were now soaking up pressure, but did launch some attacks, with Rujorn Tuitt and Misha Djemaili working tirelessly but the Woods were solid at the back: Jordan Sanderson and Ricardo Shaw both taking it in turns to block shots. But Leyton went closest to breaking the deadlock when Daniel Londono won the hosts a free kick, which he then placed an inch the wrong side of the post. Leyton Athletic had to defend a number of crosses before seeing Londono lash another shot over. The Woods however had a few more efforts before the half was done; Babalola had to be swamped out after a ball into the box nearly set him free. Cory Rider deflected an Andrea Mantovani cross away for a corner, which Scammell ultimately had to punch clear. And Leyton had to defend once more before the break; a ball aimed towards Babalola needing Miller to scoop clear. As score lines go it had been an entertaining match with either side having had a go at taking the lead. The Woods made it known early in the next period that they were there for all the points as Babalola put an early ball across Leyton’s box; Mashingdaize only able to poke his shot wide. Leyton Athletic needed the win perhaps more urgently and they went and had a go themselves soon afterwards. A quick burst had seen Mario Gjini able to fire a shot, which Luke Edgar blocked. Gjini also played provider when he laid off to Cicconi who rifled wide. But Woodford went closest just before the hour when Thompson-Brissett crossed to Sanderson whose shot needed to be palmed away by Scammell. 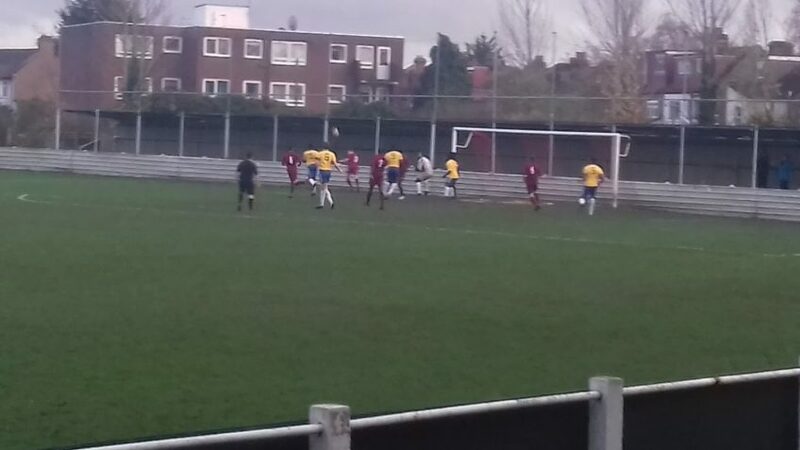 Leyton Athletic were able to then have a real close effort themselves as John Lyle struck a cross shot that whizzed past Reed and an inch off target. Leyton Athletic were by no means out of it but the Woods kept knocking. Babalola had two shots saved by Scammell; then Thompson-Brissett flashed a cross into the six-yard box that Babalola just failed to make a connection with. The Woods finally found a way through in the 84th minute. Thompson-Brissett, who had sent over several decent deliveries throughout the game, did so again having first weaved his way through Leyton’s defence before playing a weighted pass to Mashingdaize; the Woods player then finished the move by picking his spot then rifling past Scammell. Leyton Athletic need points badly and perhaps deserved something from this game. They did win two late corners in a quest for an equaliser, but the Woods went on to make it four wins on the bounce that sees them 5th in the table. Leyton Athletic remain in the relegation zone and like Barkingside also starting to get cut adrift. Leyton Athletic: James Scammell, John Lye, Emmanuel Oluwole, Jason Brown, Junior Miller, Cory Rider (Capt), Rujorn Tuitt, Misha Djemaili (Lance Ledgister 70’), Francesco Cicconi, Daniel Londono, Mario Gjini (Luwayne Greenwood 70’). Woodford Town: Alex Reed, Luke Edgar, Bailey Brown, Jordan Sanderson, Ricardo Shaw, Jack Grosvenor (Capt), Taku Mashingaidze, Andrea Mantovani (Giorgio Sallangou 70’), Temi Babalola (Adam Harris 88’), Ethan Kessel (Dejuane Taylor-Crossdale 70’), Jaden Thompson-Brissett. Scorer – Taku Mashingaidze (84’).